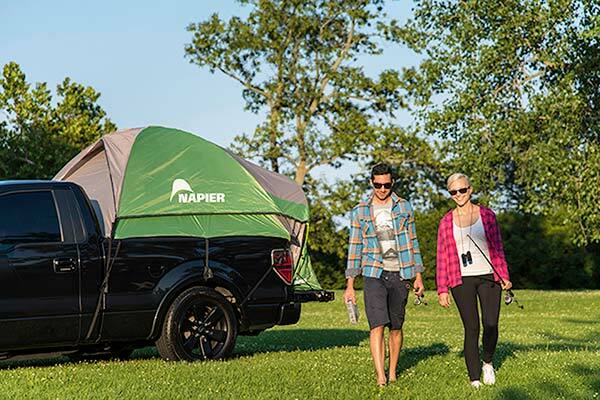 Napier 13044 - Napier Backroadz Truck Tent - FREE SHIPPING! 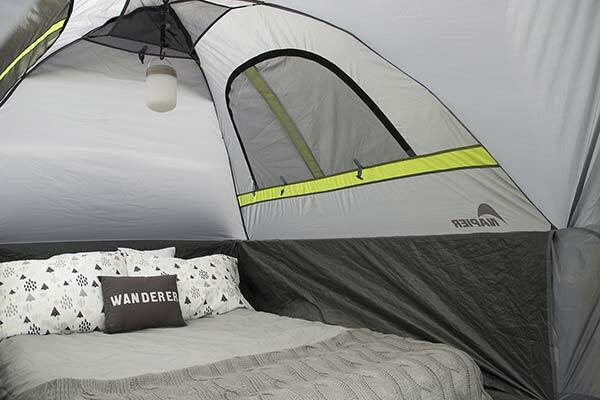 Tent is very user friendly and made of quality materials. Auto Anything provided the best customer service. Was a perfect fit for the 2006 Nissan Frontier SE. It was very easy to set up, but you will need 2 people. I think it looks pretty good on my truck. Used the truck tent for the first time this week. It fits my 2012 Toyota Tacoma perfect. Set up is easy, as I practised once at home before I left. Rained a bit both nights, and I stayed nice and dry. If you want privacy, you do have to use the fly, which is no big deal. I like that it is completely enclosed, so no critters, no mosquitos. The zippers do seem a little flimsy, but hopefully won't have any problems. Overall, happy with it so far. Fit very well, and look really nice. Fist time is a little dificult to install. 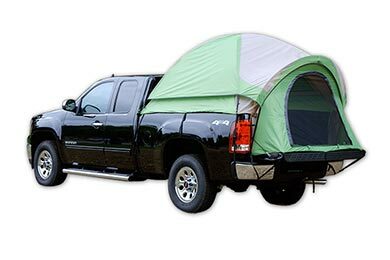 Haven't used it yet but going to memorial day weekend, I have tried it in my truck and it seems like a nicer tent. It was a gift for my wife. 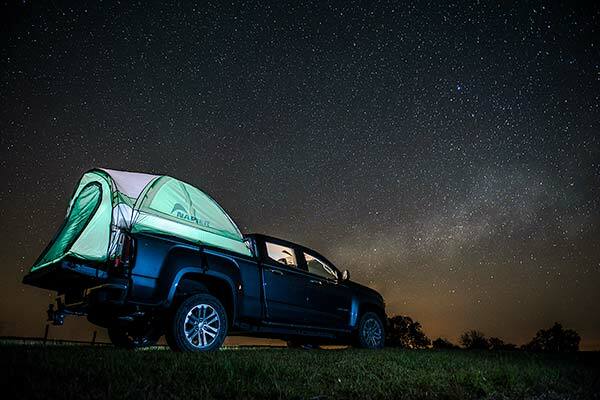 It's still cold here, but had a chance to pre-fit the tent to my Tacoma. All went well & fit snug in about 30 min. (Took my time.) The only concern I have so far are no closures for the windows except for the rainfly! I live in the Rockies & the nights still get pretty cool even in summer! 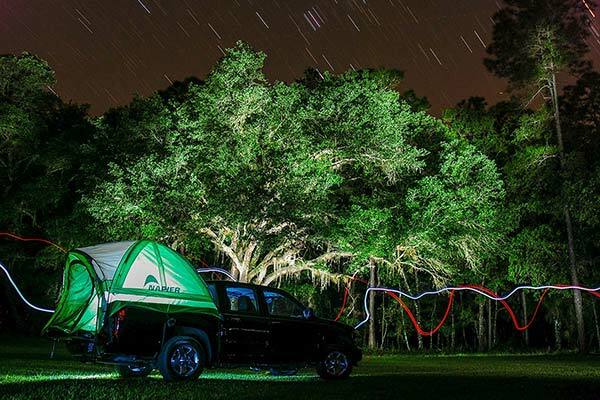 The quality & craftmanship are more beefy than other tents I have & the convenience of a small pack helps hauling lots of gear in a small vehicle! So far it's great & looking forward to giving it try! 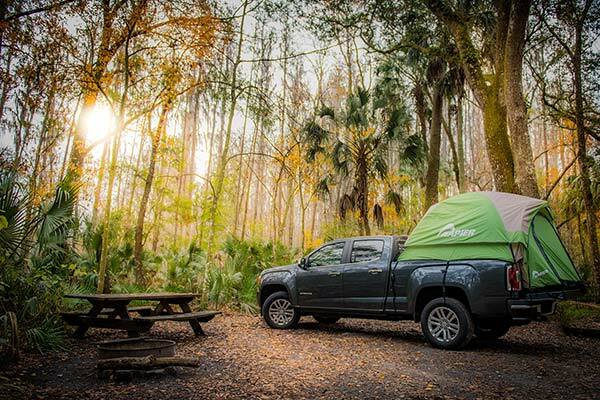 Our inclement weather in this part of the country has not permitted me to use my truck tent as yet, but opening the package assured me that all that was touted in the reviews and manufacturer's descriptions and instructions were spot on. 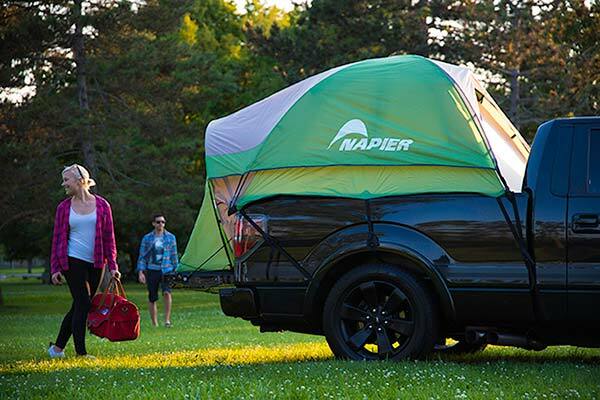 One thing I would be very much in favor of is if Napier offered an accessory of a zip-on awning extension that would provide some weather protection for your gear or for just lounging in the shade. 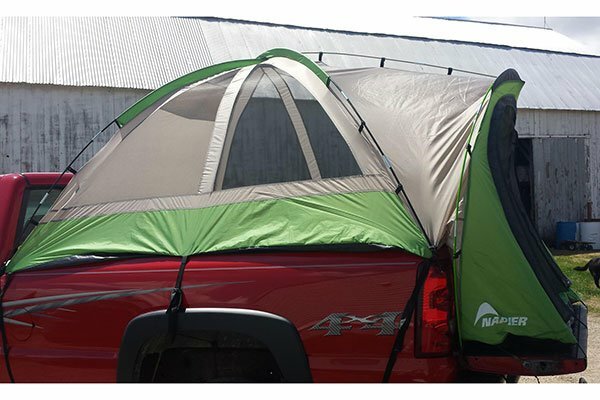 I purchased this truck tent for my 22 year old son for Christmas. 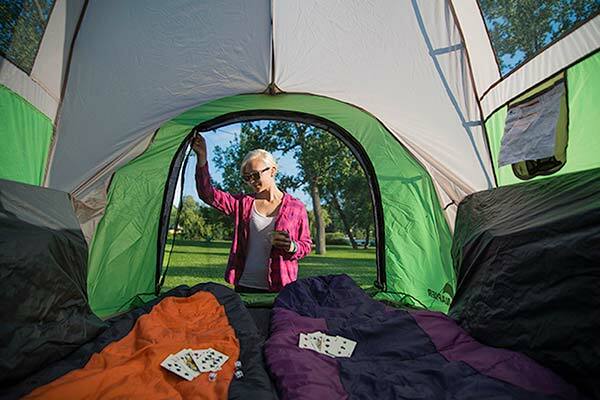 It was not any more difficult to put up than a regular tent. It was easier to assemble it on the ground and then lift into the bed using 2 people. however, 1 person assembly is possible. I like that it is completely enclosed including down around the bed. It fit in the 6' bed of a Ford Ranger just fine. Christmas gift. Can't wait to use it. Put up in the back of a 13 Nissan Frontier SV and it fits good and looks just like a regular camping tent. It's lightweight and installed easily with two people and disassembled easily with one person. There is a pocket inside to put little stuff you don't want lost in a tent and a handy hook for a lantern. 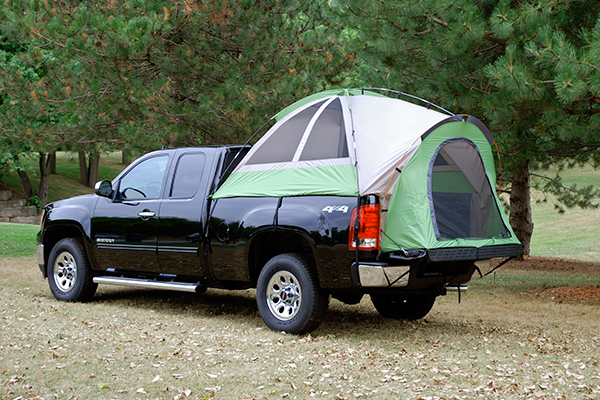 Also a zippered screen for the door in addition to the regular tent flap. The picture doesn't show it but there are windows on each side and a big one at top to see stars. setting up the tent poles is a 2 person job as they are a really tight fit. we actually cut 2 inches off of a section on the green pole used for the tent door frame to make it fit right. 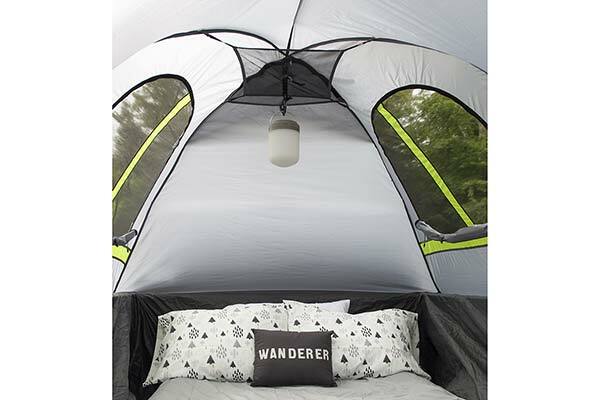 otherwise this tent is awesome. tons of room. rained the first night we used it... no leaks and no water got between truck bed and tent. 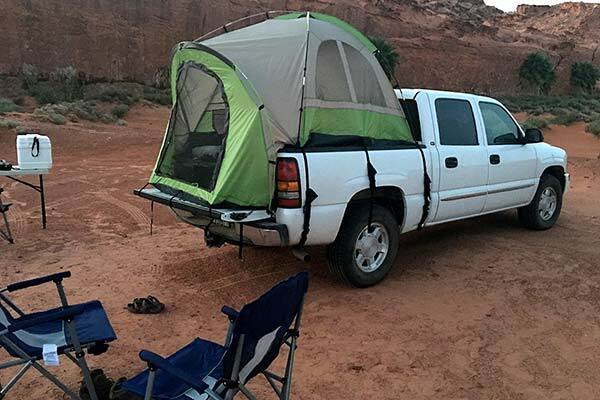 This tent is pretty slick. After the first assy. w/ help to figure it all out I can now do it by myself. 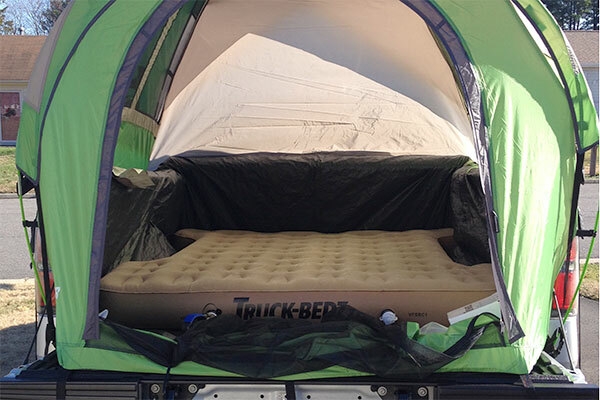 I paired it up with the Airbedz Lite air mattress and they were a perfect fit for a comfy camping experience. 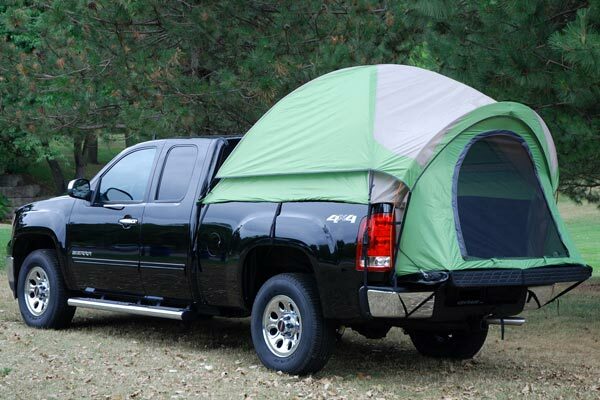 I was disappointed of the fit of the tent on my Toyota tecoma . 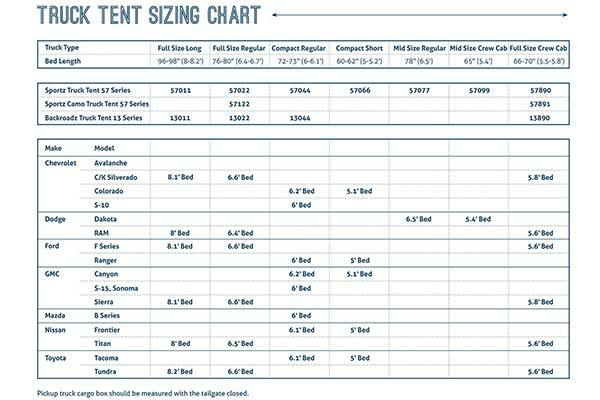 You ask for the make and model when ordering the tent. But looks and fit like one size fits all. I think it should fit each model better. Great fit, and excellent quality. The best thing, it fits like a glove over my roll-up tonneau cover! I purchased this tent specifically for the summer so I haven't used it yet. It comes packaged up in a fairly small travel box which I was impressed with. It won't take up a lot of room when I go to use it. I'll update my review after I use it for a whole weekend. Love my new tent. The instructions are easy to follow and I'm 64 years old and put it up all by myself with no problem. I took rugs to line the bottom inside which made it more comfortable kneeling on the truck bed inside the tent. Slept on a twin size air mattress and was very comfortable. Love it. 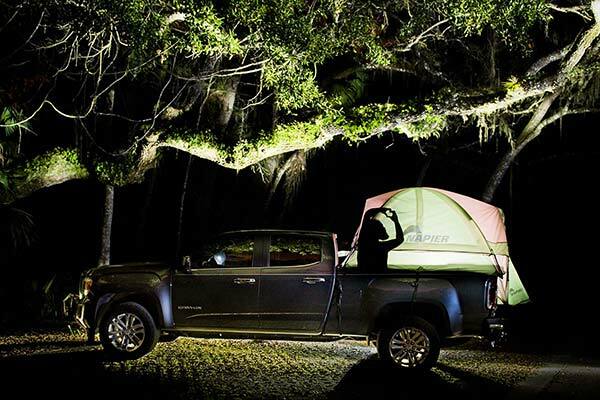 Now I have to go camping more often. Very nice product and very easy to put together am very pleased with the product. Reference # 753-511-622 © 2000-2019 AutoAnything, Inc.